'Sexism in the Sciences': List..
MTSU’s Department of Recording Industry is back on Billboard‘s semi-annual list of the nation’s top music business schools, once again joining its counterparts at Berklee, UCLA and New York University as the standouts in educating the next generation of music industry pros. The 2018 alphabetical listing of 17 schools, included in the magazine’s June 30 online and print editions, also adds newcomers like Georgia’s Kennesaw State University and Pennsylvania’s Drexel University alongside stalwarts like the programs at New York University, Syracuse University, the University of Miami and UCLA and Nashville neighbor Belmont University. Department chair Beverly Keel made note in the article of the opportunities for recording industry students to interact with their peers inside and outside the College of Media and Entertainment, “‘with those from TV and film production, digital animation, journalism, public relations, theater” and other fields,'” as well as the college’s new virtual-reality production courses. 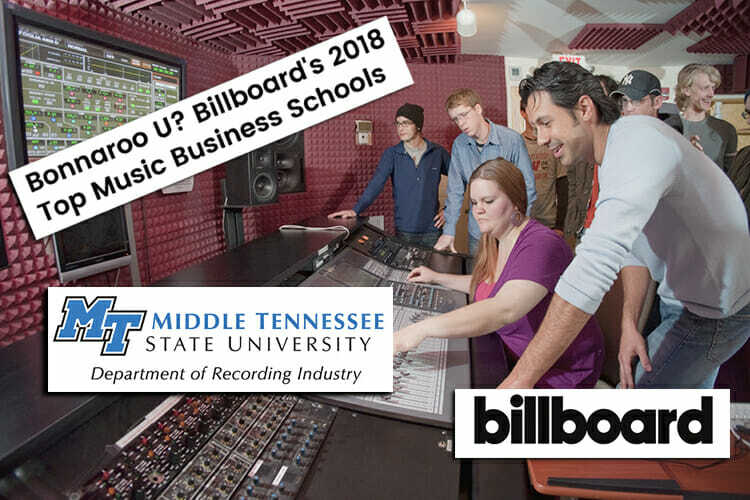 MTSU has been a part of Billboard’s semi-annual music business schools listing since 2014, when it was first mentioned in “Music Business 101: Schools Where You Can Learn About the Industry.” The magazine premiered its list in 2011 and featured music-business education rankings in 2016 and 2017, both of which also included MTSU. The department also was part of The Hollywood Reporter‘s international top 25 list of acclaimed music business schools 2014-2016. Recording industry undergrad majors in the College of Media and Entertainment at MTSU can focus on audio production, commercial songwriting or music business. A Master of Fine Arts degree in recording arts and technologies prepares MTSU graduate students for advanced work in audio production, recording and integrated electronic media. You can learn more about MTSU’s recording industry program at www.mtsu.edu/recording-industry.